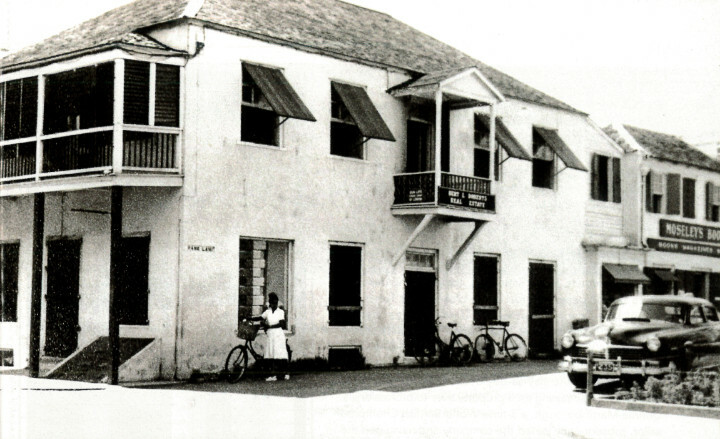 The original Bernard Sunley Building in downtown Nassau, home of Caribbean Management and Bert L Roberts Realty, the two companies who merged in 1978 to become what was later re-named Bahamas Realty, a leader in the real estate industry celebrating 70 years in 2019. Nassau, Bahamas - Bahamas Realty, a staple in the Bahamian economy and a standard bearer in the real estate industry, is marking its 70th anniversary this year with a record of more than $10 billion in sales and a history so long it predates the birth of its own CEO. “Our 70th anniversary marks a milestone in the rich history of Bahamas Realty, a company that has kept pace with the many legislative, policy and market changes and innovations that have transformed the industry,” said Donnie Martinborough, the three time world-champion sailor and commercial real estate expert who was named CEO in 2018. That, says Martinborough, helps to regulate a fiercely competitive industry with more than 700 licensed agents. Founded in 1949 as Bert L. Roberts Ltd., the early history was all about sales. “Back then, the price of an average home was about $14,000,” says Larry Roberts, Bert Roberts’ son who would go on to serve as Chairman of Bahamas Realty until his retirement late last year, though he continues to act as consultant, maintaining an office at the company’s historic estate offices on East Bay Street near Montagu Bay in Nassau. Today, Bahamas Realty handles sales, leasing, appraisals, property management and consulting. Agents and brokers have carved out niche markets by geographical area or type of transaction and the firm’s luxury sales record earned it affiliation with Luxury Real Estate Companies of the World and Leading RE Luxury Portfolio. Under its NAI franchise, it manages nearly one million square feet of commercial space, including prime office, retail, dining and warehousing. Many of Bahamas Realty’s sales associates are multi-lingual and the firm’s private island transactions have catapulted it to being among the world leaders in island sales. “Bahamas Realty has grown up with the country. In many ways, our history mirrors that of The Bahamas,” said Roberts. Mergers and growth helped define Bahamas Realty. In 1978, Bert L Roberts merged with Robin Brownrigg and Gordon Wilde who had earlier taken over Bernard Sunley & Sons Ltd and were managing the company as Caribbean Management Ltd. Combining the companies, one with sales expertise, the other with appraisal and finance, created a one-stop shop known as Caribbean Management & Sales Ltd. Three years later, with the new young partner who is now CEO, Donnie Martinborough, handling commercial sales and leasing, Bahamas Realty became the first in The Bahamas to offer a complete spectrum of services that included academically-trained and board-certified appraisers and property managers as well as sales and leasing agents and brokers. In 2010, it expanded again, re-energized by new associates from Paradise Sales and Rentals. Bahamas Realty President Robin Brownrigg says understanding how deep Bahamas Realty’s roots are is all about putting it into perspective. Unlike marketeers luring prospective buyers out to The Bahamas, 90% of the people agents and brokers interact with now start their search online. The Bahamas is less mystery, more lifestyle choice and investment. In the right location, 1949’s $14,000 home now could easily fetch $1 million and would more than likely be razed and a mini-manse rise in its place. Over its seven-decade history, Bahamas Realty has racked up numerous firsts – first to computerize, first to have a website in the days when many mistook the word browser for customer with no intention of buying. As two-time president of the BREA, Larry Roberts was a pioneer urging adoption of multiple listing services, MLS, to help democratize the industry and make searching for property online easier for clients. In 2017, Roberts was awarded the prestigious LeadingRE Leadership Award, one of the highest honours ever bestowed on a Bahamian real estate professional.